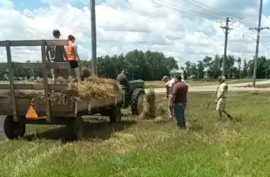 Late last week, a group of volunteers spent several days cutting and gathering wheat to be used as in a threshing demonstration during the Covered Bridge Days festival next month. Using a binder machine towed behind a tractor, the volunteers cut and piled wheat in the field located near Brodhead’s Water and Light building. After the bundles were established, the group gathered them and hauled them away. They’ll now be stored until the festival. At the Covered Bridge Days festival in August, a threshing demonstration will be located at the south end of town, near the event’s tractor show. Pick up this week’s print edition for full story……..